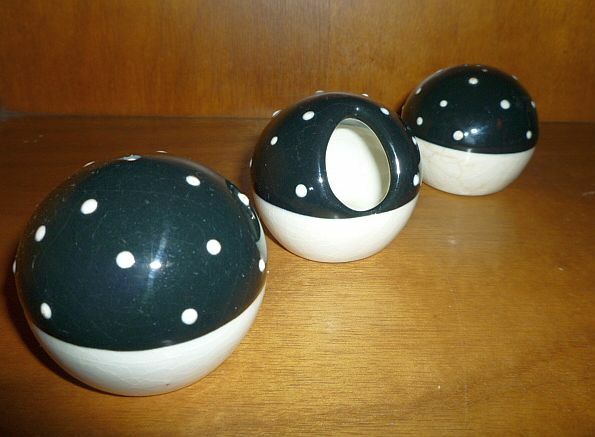 KittysVintageKitsch: New 50s Goodies-And I'm Keeping Them!!! New 50s Goodies-And I'm Keeping Them!!! I mentioned a couple of posts ago that I'd show you the fab stuff I bought at Greazefest...so here it is, making the top shelf of my china cabinet look MUCH the best it has yet. The stuff to the left is all new. 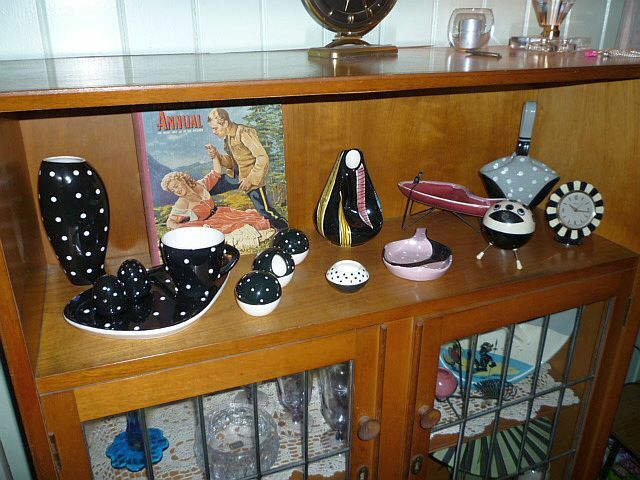 At Greazefest, our bric-a-brac table directly adjoined that of the seller next door, so when I saw the lady unpack this fabulous black and white polka dot set I immediately started making oo-ooh-OOOHHH noises. You know, like the noises a kid makes when they're busting for the loo. Sue came over, took one look and said, firmly but decisively, 'buy it'. The only things missing are the spoons- But I'll be on the lookout for them from now on. 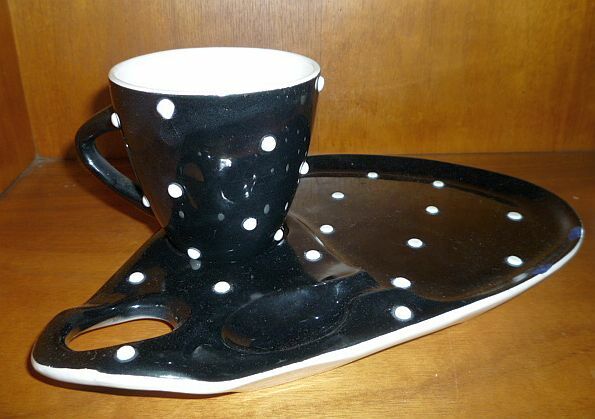 I love that the polka dots are actually in the pottery itself, i.e. they're raised, rather than just being painted or glazed on. 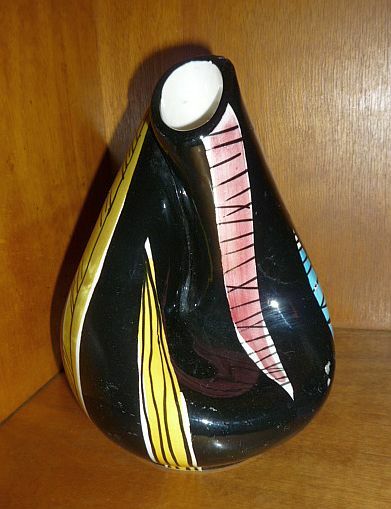 I also got this hand painted West German mid century vase, which I totally love. Quite cheap too, as it has a couple of texta'd-in chips at the back. 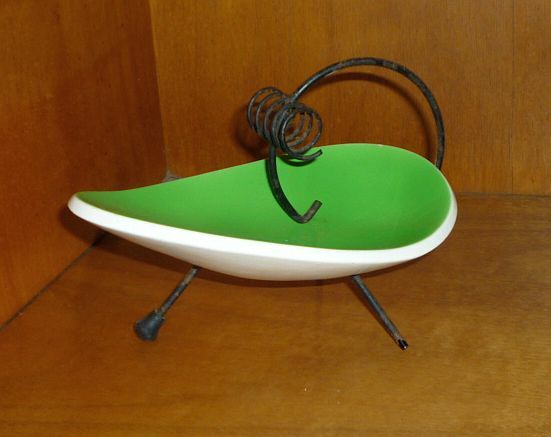 I also bought this little atomic dish, this is my third one of these, I have a blue and a brown too. Dang flash photography makes it look much worse than it is IRL, but either way it has to wait a while for a respray, with a shop and fairs and a child to deal with, I find that I'm quite slack about fixing up anything for myself- lol! These next few little pieces came from a house lot we bought a couple of weeks ago. I still have yet to tell you about the 'kitsch army' contained within, but I'll get to it soon. 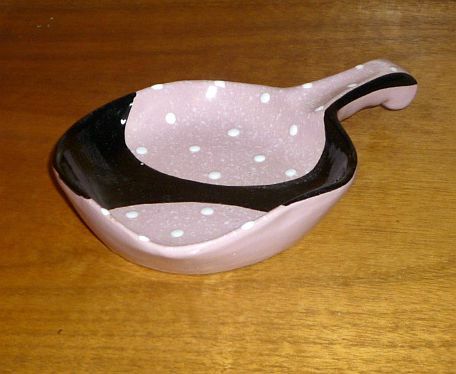 Weeny dish, again with raised polka dots, my second piece of Italian Fiorentina pottery. Not sure if I'll keep collecting this stuff-let's see how much I find and take it from there. Set of five kidney-shaped little dishes, a completely useless size of course, so they'll never be anything but ornamental. But they're cute, pretty, and the edge gilding is worn, so I'm allowed to keep them, right? Actually it kills me when I see 'set of 5...' or 'set of 3...' (whatever-it-is) for sale...3 OR 5 THINGS DO NOT MAKE A SET, PEOPLE! On another note entirely, can anyone who does quilting kindly advise me on quilting squares? I have a heap of remnants (too good to throw out, someone may enjoy them) to cut up and sell as such, who can tell what size to cut them? I have a fair idea but am not completely sure, so would like to know what you think. Thanks! The polka dot set is my fav it's so cute! Love everything but those dancers are divine. Great finds all around. 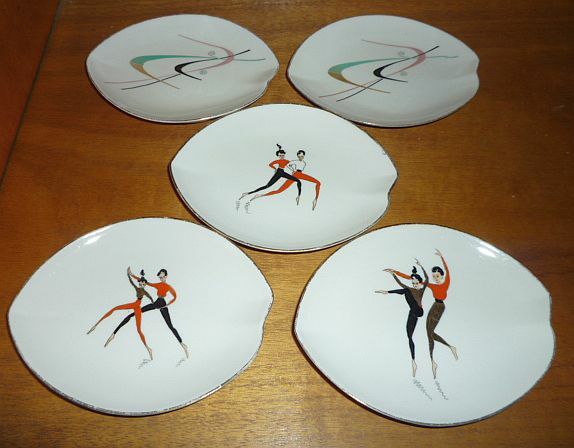 I love these funky dishes...i agree I use to hate when woman use to ask if they could buy one piece from a set instead of purchasing it complete.....frustrating indeed! Oh wow wow what lovely purchases. Love the polka dot set how cute!! fat quarters would definitely be the way to go with the fabric remnants. That is the size generally sold for quilting. 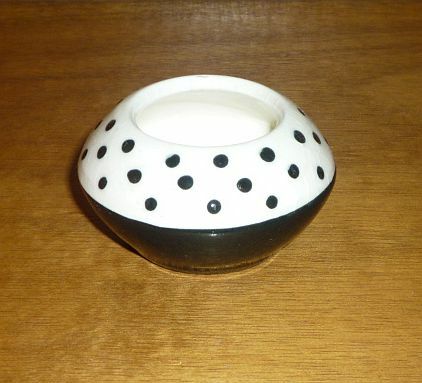 great buyts amor,polka dot mania and dancers are so cute. 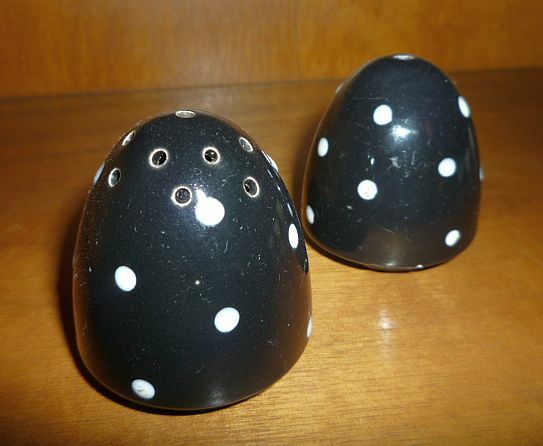 oh, i just LOVE polka dots! such cute finds! 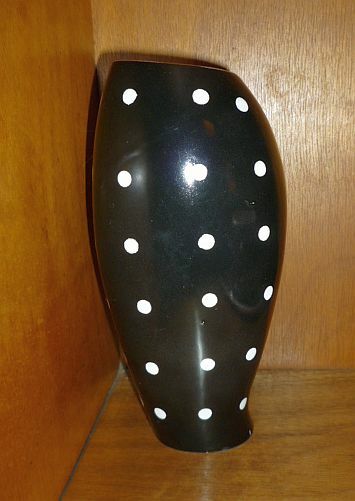 I LOVE that West German vase. 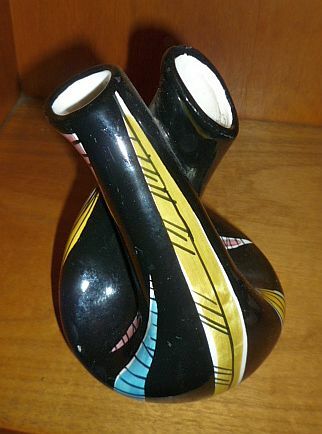 The shape is very similar to vases produced by early American and Mexican Indians--but the decoration is pure 50's. Very cool! Ooh that black and white clock rocks my world! Love it all.